There’s been a lot of recent buzz about teens and Millennials being extremely bullish on homeownership. And with that comes hope of a stronger housing recovery and even higher home prices in the future. But it’s one thing to say you’re going to buy a home (or want to buy a home), and another thing to actually do it. While ambition doesn’t seem to be lacking, the question remains whether many of these young prospective home buyers will actually qualify for mortgages. A recent report from John Burns Real Estate Consulting noted that 414,000 home purchases would not occur this year thanks to pesky student loan debt. 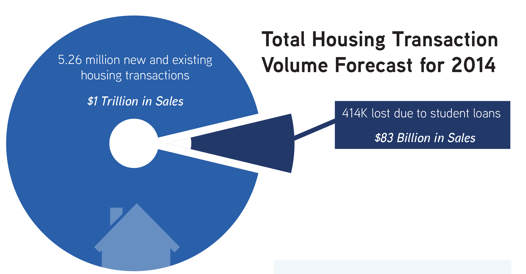 Using a typical purchase price of $200,000, that equates to nearly $83 billion in lost volume for the real estate industry. And with 5.26 million new and existing home sales expected this year, that represents about an eight percent loss in transactions thanks to costly student loans. There are a reported 5.9 million households under the age of 40 paying over $250 per month on student loans. That represents 35% of such households and is up from 22% back in 2005. For these households, qualifying for a mortgage gets a lot more difficult thanks to restrictive debt-to-income limits. It’s compounded by the new Qualified Mortgage rules that limit DTIs to 43%, coupled with the fact that home prices have risen dramatically. The only thing offsetting this is the fact that mortgage rates remain historically low. For those who can still purchase a home, it reduces their purchasing power by $44,000. So you basically need to look at a smaller home, or a home in a less desirable area. This can get pretty tricky if the recent grad has accepted a job in a certain locale and doesn’t want to spend half their day commuting. The prevalence of households with student loan debt also mean it’s more difficult to save for a down payment. And with the FHA becoming a lot less viable for many prospective buyers, more money is needed to get the job done. Perhaps this is why 27% of first-time home buyers received a gift from relatives or a friend last year, per the National Association of Realtors. That’s up from 24% in 2012 and matches the highest level since NAR beginning tracking in 2009. It’s apparently even higher this year. The Realtor group also revealed that 54% of first-time home purchases were delayed in 2013 because student loan debt hurt their ability to save for a down payment. Simply put, college students are spending a lot more money on tuition but salaries don’t seem to be rising. In fact, incomes appear to be dropping, with college graduates aged 18 to 34 years old working full time experiencing a $3,300 drop in average annual earnings from 2007 to 2012 (adjusted for inflation), per Census Bureau data. Factor in all the competition in the housing market that demands either a larger down payment or a higher bid and you’ve got a recipe for renting. Perhaps the home builders will take note of this trend and start constructing more affordable housing. Tip: There’s nothing wrong with accepting a gift from a parent or relative because a low down payment can raise your mortgage payment three different ways, which could cost you a lot more long-term.